PRODUCT: WallSecure economical drywall adhesive from ChemLink. Odor free, meets all VOC requirements, solvent free, low allergy adhesive, tan color, 28 oz tubes. 12 tubes/case. Price/case. 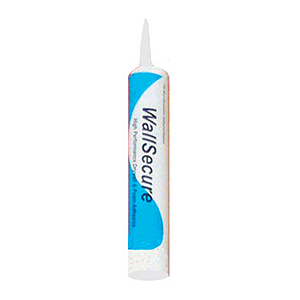 DESCRIPTION: WallSecure is a solvent-free, non-flammable, low odor, allergy free, moisture-curing adhesive. Its primary uses are adhering drywall to wood, wood to metal or installing EPS foam insulation. With 100% solids, it fills gaps to secure irregular surfaces without shrinking. WallSecure can also be applied in temperatures down to 30 °F. WallSecure should not be used in areas subject to continuous moisture. Also, treated wood should be allowed to cure for six months before application. Composition: Chem Link BuildSecure is a 100% solids, solvent-free, formulated silyl-terminated polyether adhesive. Solvent Content: BuildSecure contains no solvents or V.O.C.'s. Bonding surfaces must be clean and free from dirt, oil and debris. If surfaces require cleaning, use alcohol. See data sheet for more detailed instructions.